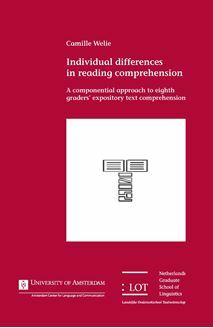 Why do secondary school students differ in their text comprehension? This is an important question, because many secondary school students lack the level of text comprehension required to enable learning from their school book texts. This thesis contributes to answering this question, by focusing on individual differences that could explain why secondary school students differ in their comprehension of expository texts. In earlier research, sentence reading fluency, general vocabulary knowledge and metacognitive knowledge have been identified as important components of skilled reading comprehension. This thesis examines whether knowledge of connectives, text reading fluency, text structure inference skill and reading motivation are components that add to the understanding of the individual differences in reading comprehension. Furthermore, it is examined whether the contribution of these four components depends on readers’ language backgrounds (monolinguals versus bilinguals) or on their level of other cognitive resources. The results show that knowledge of connectives and text structure inference skill make an additional contribution to eighth graders’ expository text comprehension, whereas text reading fluency and reading motivation do not. Language background and cognitive resources do not impact the contribution of any of the four components, with one exception: the contribution of knowledge of connectives is reinforced by readers’ metacognitive knowledge. This book contributes to our understanding of expository text comprehension skill and as such hopes to contribute to improved text comprehension among secondary school students.